NYKOKA » Call for Artists! Address: Pilies str. 4, Kaunas, side wall of a multiapartment building. Sketch designs and visualisations should be sent by the 15th of August 2017 to labas@nykoka.lt. The implementation should be in September/ October. Location: This wall is called the gate to the Old Town; it is also frequently passed by both Kaunas residents and its guests; therefore, it is a sensitive location which might become a signature element in the area. Because of the landmarks situated nearby (Town Hall Square, Kaunas Castle and the confluence of two rivers) and Kaunas National Culture Centre, this work of art can become recognisable and associated with Kaunas city in general. Criteria for the sketch: Taking into consideration the specifics of the place, the design must fit in its surroundings, be contextual and positive. Such aspects as originality, aesthetics and actual possibilities to implement the project will be evaluated. Terms and conditions: The festival shall provide all materials and tools to implement the project and a 450 EUR honorary (the amount may change depending on the size of taxes). Sketch formats: The sketch should be provided on a wall’s outline; visualisations should be introduced on two photos (of the house and the panoramic one). The size of these photos should be kept as it is, i.e. in 300 dpi resolution. The outline of the wall and other photos can be downloaded here. 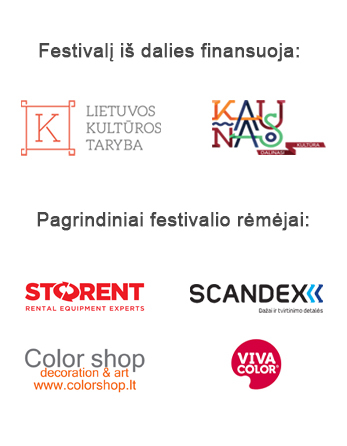 Sketches and visualisations shall be published on festival’s website and exhibited in Kaunas Artists’ House from the 22nd of August. The winner shall be announced on the 24th of August. The best of creative inspiration! © 2019 NYKOKA All Rights Reserved.